Metrological approval is a process of state monitoring of measuring instruments and analysing instruments. The metrological approval certificate confirms that the certified measuring instruments meet the minimum requirements of the technical regulation in Russia. This means that the measurement deviations of certified devices are secured by the Russian state, and the devices themselves have been subjected to the necessary measuring and custody checks. After successfully passing the measurement tests, it is registered in the state register as a measuring instrument approved within the Russian territory and may be used in Russia from this date. 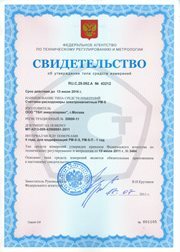 The metrological approval certificate is a certificate which states the conformity of the legal instrument of measurement with the technical regulation in the Russian Federation. The Federal Office for Technical Regulation and Metrology – Rosstandart - is responsible for monitoring of measuring instruments and metrological certification in Russia. Measuring instruments used in these areas are subject to compulsory regular monitoring by the Russian Federal Office for Technical Regulation and Metrology - Rosstandart. In accordance with the Federal Law № 102 "On the Guarantee of Uniformity of Measurements", every duly certified measuring instrument shall be entered in the appropriate state register. The obligation to keep the register of approved measuring instruments is the duty of the Russian Research Institute for Standardization and Measurement - VNIIMS. A so-called voluntary metrological certificate serves as a quality proof for measuring instruments that are not subject to mandatory metrological monitoring and certification. However, the voluntary measuring instrument certificate can not replace the obligatory registration, if required by the law for a particular type of measuring instrument. The method of voluntary metrological certification is defined by the Federal Law of the Russian Federation "On the Guarantee of Uniformity of Measurements". The voluntary certification of measuring instruments may only be carried out by the notified bodies which are accredited by the Rosstandart. Voluntary metrological certification shall be carried out at the initiative of the manufacturer or the distributor, in order to confirm the conformity of the instrument with the requirements of the technical regulations and to secure consumer confidence. Please note that in case of delivery of machinery and equipment, especially for governmental and municipal requirements, for example, when public procurement contracts in Russia are generally required by the authorities, the corresponding EAC certificates and metrological certificates are required. The maximum validity of a metrological approval certificate is 5 years, after which the measuring instrument has to be rechecked and certified. The application for a certificate can take place according to different procedures: for single-supply, for serial delivery and for serial production. For metrological approval for serial production, the manufasturing audit is compulsory. Depending on the application area, the list can be extended. After the measuring instrument has passed all the required measuring tests and has been entered into the state register of the approved measuring instrument on the basis of the Rosstandart decision, the measuring instrument must be marked with the "СТ" calibration mark -- Approved measuring instrument. The marking of measuring instruments with the "СТ" mark is only permitted during the validity period of the metrological certificate. After expiry of the certificate, the mark is no longer permitted. The "СТ" should be placed on each measuring device and must be legible. The technical accompanying documents shall contain the information about certification and registration. The misuse of metrological marks can lead to legal consequences. The terms and the costs associated with an EAC certificate application, depend on several different factors, such as the classification of product, any required laboratory checks and complexity of all examinations. As such the exact conditions of the certification are always determined individually based on the required documentation. Please note that an application for a metrological certificate can take few months to process. If you order a metrological certificate, you will receive a copy of it via email immediately upon our successful certification process. Alongside you will receive the original document and two certified copies of it by post. Request an offer for metrological approval certification! Please call us or send us an email. We will provide you with a free, non-binding quote and will be glad to answer all your questions about metrological approval certification for Russia. Convince yourself of the quality of our services!